Jack Marriott wheels away in delight after putting Posh ahead against Portsmouth. Photo: David Lowndes. The knives were being sharpened at half time. The shouty people on social media were clearing their throats and loosening their fingers. Posh had been poor in a poor, goalless game against poor opponents. After Gwion Edwards had clipped the crossbar and Marcus Maddison had seen a fierce strike beaten away by former team-mate Luke McGee in the Pompey goal, misplaced passes and sheer frustration became the name of the game against a typically well-drilled and rather negative Kenny Jackett team. Jack Marriott thanks Posh team-mate Marcus Maddison for the assist on the opening goal against Portsmouth. Photo: Joe Dent/theposh.com. There was no obvious dissent among the dwindling home support, just resigned apathy. Many probably feared the worst especially when Kai Naismith forced Conor O’Malley into a fine low save during Pompey’s best spell of the game in the early stages of the second half. But Posh boss Grant McCann also hadn’t enjoyed the first 45 minutes. His preferred formation of three central defenders and two deep-lying midfielders had failed to generate any attacking tempo or momentum so the midfield diamond, or the ‘dreaded diamond’ as it became known last season, was re-introduced at the break. It would be over-egging it to say the transformation was immediate or breath-taking, but credit to McCann for a tactical switch that breathed life into Maddison and enabled Posh to gain an important victory, one that was ultimately well deserved. PLeasingly the win moved Posh up four places to seventh, one short of the play-offs although the current top six is full of strong, well-fancied sides as well as Shrewsbury who have a big points buffer to absorb the sort of shock result that hit them last night (November 21). Gwion Edwards fires in a cross for Posh against Portsmouth. Photo: David Lowndes. But much can happen between now and May. For now Posh can be satisfied at emerging from a disappointing weekend to steady the ship, although the continued fitness and availability of Maddison and Marriott will be key to future achievements, particularly the former who is setting up so many chances any striker capable of standing in the right position can expect to enjoy a 20-goal season. The cross for the opening goal just before the hour mark last night was a thing of beauty. Maddison, released by Danny Lloyd’s precision, swung the ball perfectly between two Pompey defenders and McGee for a sliding Marriott to convert from inside the six yard box. It was a pressure-relieving moment and Posh bossed the rest of the game, even the final 12 minutes after substitute Conor Chaplin, from a suspiciously offside position, had pulled a goal back for the visitors following Conor O’Malley’s fine low save from Danny Rose. Posh had earned a 2-0 goal lead 20 minutes from time when Maddison, who had been felled by former Posh defender Christian Burgess, whipped in a free so so deliciously inviting, Pompey’s Matt Clarke won the race to glance it into the net. Chaplin should have actually pulled a goal back immediately after Clarke’s misdemeanour, but hit a shot so tame Anthony Grant had the time to race back and head off the line, but, apart from a speculative first-half strike from Curtis Main, that was the sum of Pompey’s attacking highlights. They lacked pace, poise and, most importantly, top scorer Brett Pitman who missed the match because of injury. Posh won’t be fooled into thinking they’re completely back on track even though the cool head of Steven Taylor at the back, the promise of O’Malley and the will to win of midfielder Grant, as well as the consistent excellence of Maddison and Marriott, suggests the first team’s spine is strong. 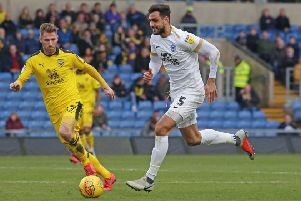 Posh haven’t won back-to-back games since the end of August though and they travel to lowly Rochdale on Saturday (November 25), the sort of team they’ve regularly played back into form this season. Posh: Conor O’Malley, Jack Baldwin, Steven Taylor, Ryan Tafazolli (sub Andrew Hughes, 46 mins), Leo Da Silva Lopes, Gwion Edwards, Anthony Grant, Michael Doughty, Marcus Maddison (sub Jermaine Anderson, 85 mins), Jack Marriott, Danny Lloyd. Unused substitutes: Idris Kanu, Jonathan Bond, Chris Forrester, Ricky Miller, Alex Penny. Portsmouth: Luke McGee, Gareth Evans, Christian Burgess, Oliver Hawkins, Matt Clarke, Danny Rose, Ben Close, Jamal Lowe. Kai Naismith, Matty Kennedy (sub Dion Donohue, 82 mins), Curtis Main (sub Conor Chaplin, 64 mins). Unused substitutes: Alex Bass, Nathan Thompson, Stuart O’Keefe, Adam May, Kyle Bennett. Goals: Posh - Marriott (58 mins), Clarke (og, 70 mins). Cautions: Posh - Grant (foul), Edwards (foul).